The recipe below is my mother's recipe. We usually prepare hundreds at a time and freeze them. When we are craving the eggrolls or planning a gathering, we just take them out of the freezer and fry them to a golden deliciousness! **Note, it is extremely important to keep the ground pork refrigerated until the very last step. Any ground meat is easily susceptible to develop bacteria and cause food poisoning. 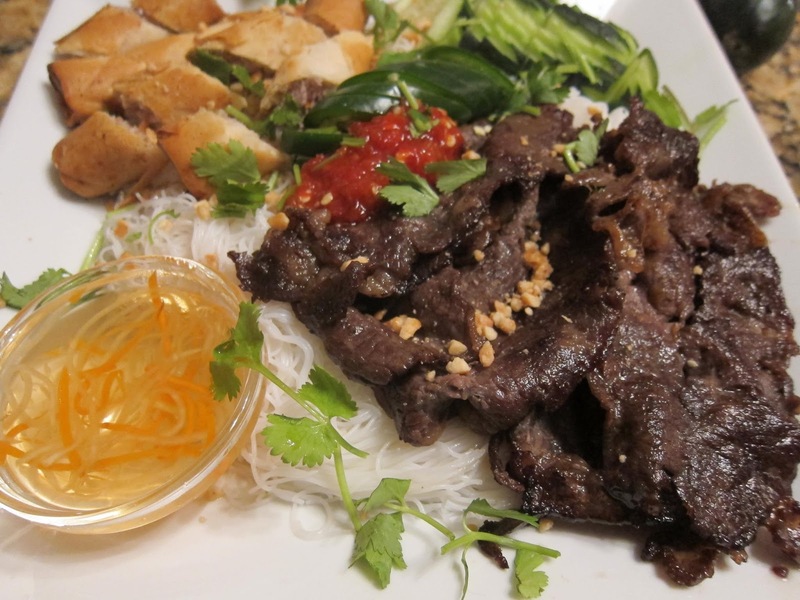 Many people make the mistake of leaving the meat out too long and this causes a mildly sour flavor in the eggrolls which is a cause of food gone bad. The most annoying part of making eggrolls is prepping the vegetables. All the vegetables have to be shredded by a mandolin or a hand shredder. Wash and cut the cabbages in half. Shred the cabbages using a mandolin. I have an Asian version that my mother bought me but you can use any fancy one from a kitchen store as well. 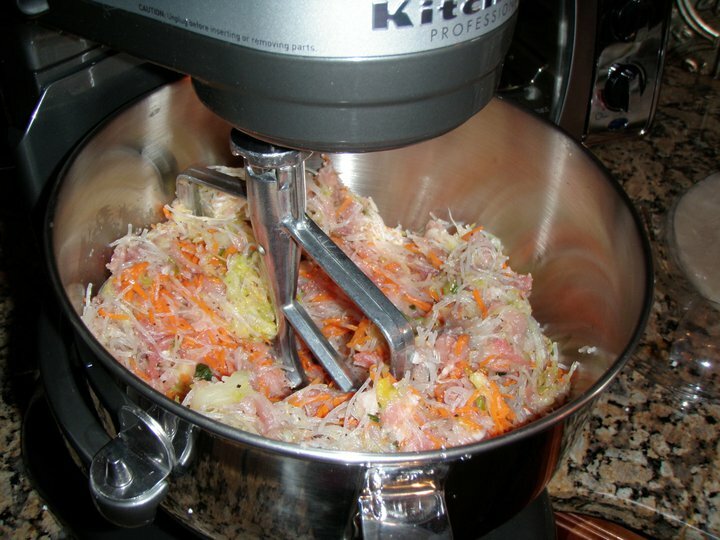 Once shredded, the cabbage is salted to draw out the water and squeezed and washed several times below. Pour salt generously onto the shredded cabbage and start squeezing until water is released from the vegetables. After a good amount of water is visible, wash the salt off the cabbage and squeeze the cabbage again. This step is done so that the cabbage is not slimy and cause the eggrolls to be soggy. Remove the thick skin from the taro and use the hand shredder to shred the taro. You do not need to salt and remove water from the taro. Slice the green onions into small rings. This is an optional ingredient since there is already onions in the mixture. I like to use the green onions for the color. Soak the rice vermicilli in hot tap water and let it sit for 5 minutes. 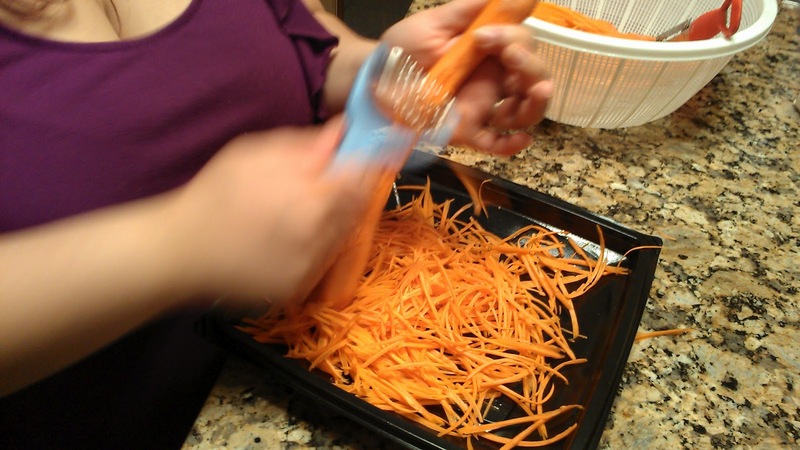 Drain the noodles and use a scissor to cut the noodles into smaller two inch pieces. Combine the vegetables, noodles, ground pork in a large mixing bowl. Some folks like to add oyster sauce, fish sauce and soy sauce. I prefer not to. If you do not want to use your hands to mix the ingredients, you can use a electronic mixer. This is what the mixture should look like once mixed. 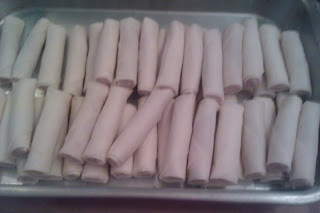 It is unlikely that you will be able to roll all the eggrolls fast enough, so I strongly urge you to portion out the filling to two bowls and cover and refrigerate one immediately. Gather your supplies to start rolling eggrolls. I prefer to use a cutting board, baking tray (to hold the eggrolls), freezer storage bags, fork, egg yolk or starch glue. I position myself on the dining table with a view to the TV since rolling the eggrolls is time consuming. 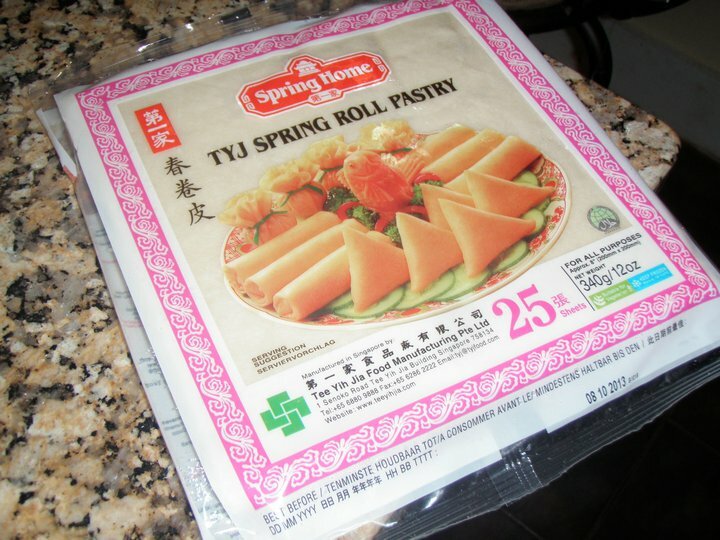 This is the eggroll wrapper that I prefer to use when making eggrolls. Make sure the eggroll paper is thawed in the plastic wrapper before using. It is nearly impossible to roll with frozen paper as it tends to rip when you try to pull them apart from each other. Place the wrapper in a triangle on your cutting board or plate. Using a fork, add 2 tablespoons of the pork filling mixture slightly above the bottom of the triangle. Use your fingers to take the bottom of the wrapping paper and cover the top of the pork mixture, try to be as tight as possible with no air pockets. Roll the mixture up until you get to the middle of the two side left and right triangles and stop. Fold the side triangles into the middle of the roll. Continue to roll the eggroll towards the top of the paper, continuing to be tight as possible. Once you reached the top of the paper, dab your finger in the egg yolk or starch glue and rub it on the tip of the paper. Continue to roll up until it becomes a roll. I like to fill up my baking tray and start to pack them in freezer bags as I go. 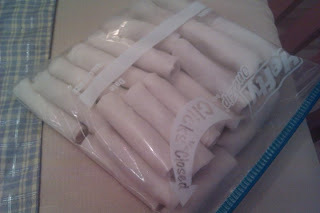 For every 30-40 eggrolls, I make, I bag them and freeze immediately so they do not sit out at room temperature longer than necessary. 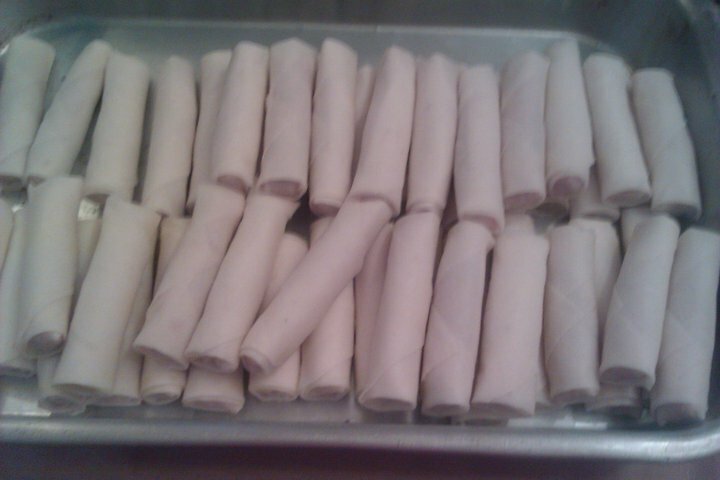 It took me about 3 and a half hours to roll all the eggrolls by myself. Usually, this is a joint family activity with mothers and sisters and aunts all working together to get the task done, so the time is definitely shaved when working with a group. I prefer to fry my eggrolls frozen so they don't break apart. DO NOT THAW THE EGGROLLS BEFORE FRYING. 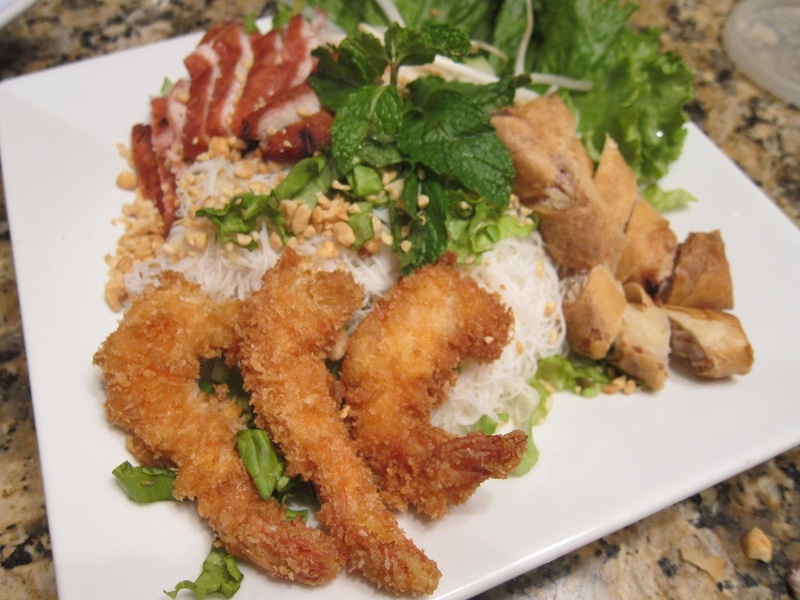 Heat a large wok with frying oil to a medium temperature, do not set on high as the eggrolls will burn before the mixture is thoroughly cooked. 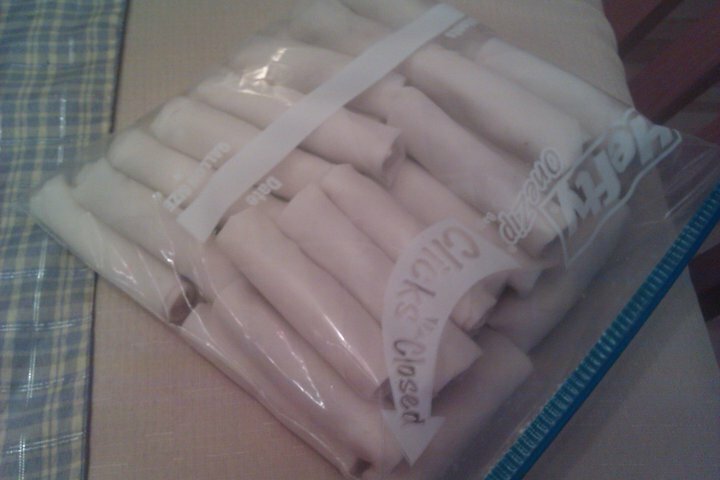 Remove the frozen eggrolls from the freezer bag. Sometimes they are stuck together and may need some force to break them apart. I like to slam them on a clean counter top and they easily break apart. Once the oil warms up, fry the eggrolls on medium heat for about 10 minutes. Do not overcrowd the eggrolls as the frozen eggrolls naturally brings down the temperature of the oil and will become soggy. I prefer to fry 12-15 eggrolls at time, depending on how large the wok is. After the eggrolls float up (which is after 10 minutes) and they are a golden brown, remove from the oil onto a bed of paper towels to help drain any excess oil. Let them cool and serve with sweet chili sauce. You can also serve them cut up in "Banh Hoi" noodle salad with sweet fish sauce.